Teaser: 2019 is waiting just around the corner, and when listening to different forecasts, one could get the impression that next year will be the most boring year in the financial markets throughout decades, though I doubt. On behalf of our clients at this time of the year, we normally ask a number of asset managers about their expectations for the coming year. As always in my universe, the interest rate of U.S. 10-year government bonds is the most powerful and most significant interest rate of all interest rates in the financial markets. In my assessment of future developments, this particular interest rate always has special importance, though it of course changes how big a role it plays in the markets. I argue that the financial markets are currently in a phase where the U.S. 10-year rate means more compared to an average situation. But my perception is that majority of the market participants think differently. Despite the recent drop in oil prices, it remains in my view, that the current expectation in the financial market is another hike by the Federal Reserve Bank (Fed) in December, thus entering the new year with a Fed fund rate of 2.50 pct. Since summer, majority in the financial markets believed in three more American rate hikes in 2019, moving the short-term rate up to 3.25 pct. in about 12 months-time. Recently, I have noticed more economists arguing for just two hikes next year. A completely fresh survey among U.S. economists made by TV station CNBC confirms this. However, the water is still divided by 45.9 pct. of the respondents voting for two interest rate increases while 40.5 pct. continue to argue for three interest rate hikes. Regardless of whether one expects two or three rate hikes in 2019, my view is that the attitude towards the U.S. economy next year is largely the same, no matter who is being asked. 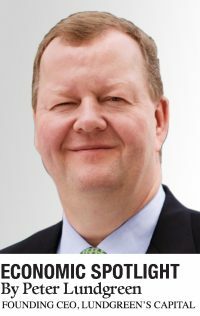 The dominant position is that inflation does not rise to a higher level and will rather be under control, and at the same time, economic growth will slow-down. For the same reason, there are many expectations of a 10-year interest rate moving around 3.25 pct. throughout 2019. The arguments that I meet are primarily referring to the developments of the classic macro-economic data, such as inflation and GDP growth. But what consequence does this dominating view have for the financial markets? Clearly, a large majority of those I have had contact with believe that the U.S. interest rate curve will be as flat as the famous pancake next year. With a further two to three hikes in 2019, the Fed fund rate will end at either 3.00 or 3.25 pct. compared to the current 10-year yield of 3.05 pct. Right now, it looks like a flat yield curve next year, and I have even considered the opinion that the 10-year yield could drop below three pct.- meaning a slightly inverted interest rate curve. It’s a very unusual experience to encounter such few markets participants that simply don’t believe in a plain parallel shift in the yield curve. So far, it has been hard to find somebody who calls for a rise in the 10-year rate to just 4.00 pct. It should be remembered that the Fed is expected to raise the short-term interest rate by a total of 0.75 to 1.00 percentage points until the end of next year. Therefore, a call for the 10-year yield to reach 4.00 pct. doesn’t seem outrageous, given the current economic conditions – I find this phenomenon quite fascinating…. I do so because there is an imminent danger of consensus lulling itself to sleep ahead of an apparently boring year. Though as graphic one shows, there is no indication that pessimism shall suddenly knock on the door in the U. S. on 1st January. 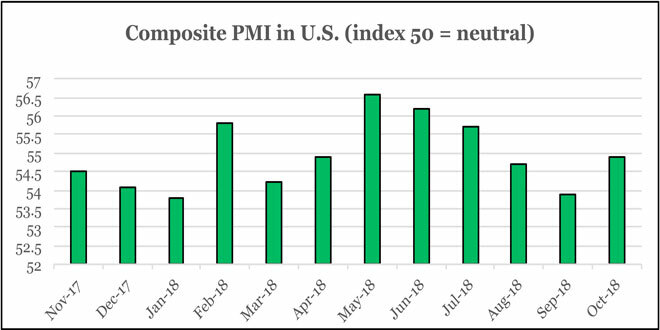 The graphic shows the composite PMI, i.e. the aggregated expectations of all business sectors in the United States, where an index above 50 indicates expansion. The higher the number, the greater the expectation of expansion is, where the current numbers are in the fairly expansive area. Retail sales is also at a relatively high level, and the same goes for consumer confidence. In terms of inflation, I agree that energy prices could fall, which of course helps lower inflation. But food prices do not necessarily decrease, and there is increasing risk that wage inflation will begin to push upwards in the United States – all factors that prove healthy economic activity. I argue that these factors simply support a parallel shift in the yield curve, lifting the 10-year rate to 3.75 pct. and maybe even snapping at 4,00 pct. when this decade fades out. The “boring” majority in the financial markets claim that President Trump’s economic plan won’t last, and that hot air will runout of the growth balloon – I fully agree, though not as fast the financial markets price-in, and at a later stage, it gets even worse. 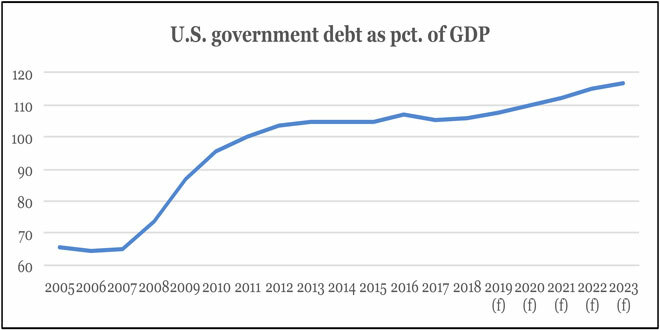 Because, as many also point out, the government debt will grow significantly, which is naturally a burden to the economy. It is absolutely true and shown by the International Monetary Fund’s expectations in graphic two – the United States is heading for an unsustainable level of sovereign debt. The first step on the journey will be a bigger supply of government bonds, which supports the argument of higher interest rates on government bonds. Down the road, there is an increasing risk of nervousness about the American public debt, and the country’s ability to cope with the burden. When this stage is entered, then the treasury yields will really move up, though that is another story – the next step is 4.00 pct.